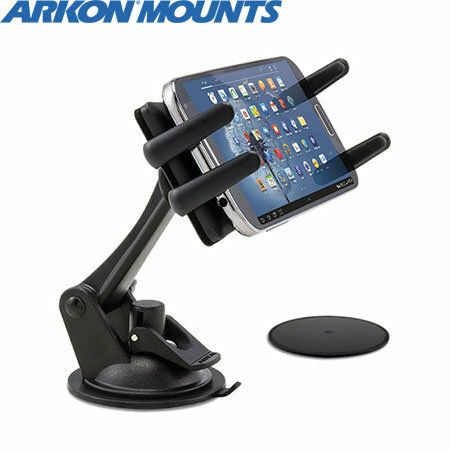 Arkon's Slim Grip Ultra Sticky Suction Smartphone Car Mount provides a strong, unobtrusive grip for use with smartphones up to 6.75 inches tall. Excellent adjustment range and grip..
Great bit of kit, easy to use. I'm using it in portrait not landscape position and it would be nice if the 'fingers' were shorter as you have to reach over them to touch the home button. Not a deal breaker though just an observation. As soon as I received delivery I mounted it on my dash. Be sure to use the disc (it's included) if mounting on the dash. It won't hold without it! It works like a dream. Very solid. I'm happy and recommend this mount. It's easy to assemble, holds well and most importantly - WORKS! It took me minutes to place and stick on the dashboard and it sits so well with the arm pointing down so as not to obscure the windscreen view. However, it was not until I looked to put the arms on the holder that I thought I had to select the arms which were just the right size for my iPhone 6 to fit which were the L shaped ones but that meant my wife could of use my car as her phone is the iPhone 5 and she does not want to switch to a larger one. This was disappointing and I was going to contact you to let you know when out of the blue while putting my phone into the holder one end of the holder moved out on springs and then I realised I could select straight arms in one end and the L shaped on the other and both phones could be used. Therefore if the wording was very clear as to which arms would be best for which phones and show clearly on the pictures that there was a spring mechanism then my initial disappointment would have been avoided. Thanks so far though for a great product! It took a while to find but this is a car holder that does fit the iPhone 6 and 6s plus phones. Slightly cheap feel but grips and holds phone well and fixes to windscreen securely. This is a really solid support for my phone. I have the phone in a flip case and it fits very nicely into this stand, I use my phone as a sat nav and this holds it very steadily. The prongs which hold the phone in place are easily adjusted so they miss the side buttons on your phone. Whilst the stand is very solid it is quite easily adjusted to suit your viewing angle. It sticks to both glass and the plastic dashboard no problem. My only slight niggle with this is the pad is sticky and really difficult to get off the surface. When I park in certain places I don't like to leave the mount visible as I have heard stories of cars being broken into when sat nav mounts are visible. Really good car mount for your phone.